BarnCam.com – Saddlebrook BarnCams LLC -See what you've been missing! Protect your investment and be there when they need you with a state-of-the-art BarnCam. Births, veterinary emergencies, hauling, security and peace of mind…a BarnCam will meet your needs. A BarnCam is a simple video monitoring system used to monitor almost anything, anywhere. Horses and Cattle Barns, Puppy Pens, or your exotics. 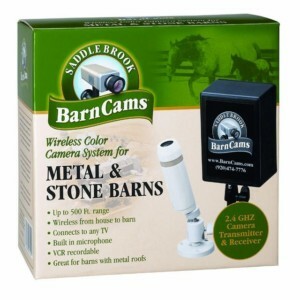 If you value your animals, we have a Barn Camera system that is right for you. Do not risk missing a birth that needs your attention. With thousands of systems in use around the world we offer the best sales, support and system design around. We offer only the latest in wireless barn camera technology making installation simple and convenient. Our 2.4 Ghz systems penetrate right through walls and floors. These systems can be placed up to 1 mile away from your TV with an extra high power transmitter. All models hook up to standard TVs or VCRs. We even offer systems for metal barns and trailers. Plus all of our Metal Barn systems have at least 700 lines of color resolution and include audio and infrared at no extra charge. Once you have your camera up and running, why not put it on the web so that you can watch it from work, or when you are away from home? All you need is an internet connection, our WebCam Kit or an Encoder. Complete packages are our specialty! We got a Barn Cam from you the other year – it is most definitely one of, if not the best investment we have made in our operation in Pennsylvania. We have not experienced any problems with the unit and are more than satisfied. Not only does it save countless trips to the barn to check on the animals, but it has saved quite a few, too. Thank you, again for offering such a quality product! Sincerely, Julie M.
We just bought one of the metal bldg barn cams and we installed it last weekend. It is awesome, we love it. We wont have a baby horse until March and we can not wait…. The picture is sharp and the sound is wonderful (we did not realize it had sound). Thanks so much. Marla D.
The Original Barn Camera Company. Back in 1996 we invented the BarnCam right here on our little farm in Oconomowoc, WI. My wife Susan, was out of town on business and I put a camera in the barn and wired it to the internet so that she could view it from Georgia during a business trip. The mare foaled perfectly and she was able to watch it from over 1000 miles away. We left the camera on and soon everyone from around the world was watching and calling us about how they could get a system. The Barn Camera industry was born.